Fennel is an herb that grows wild in most parts of Europe and the Mediterranean. The seeds of the herb have been cultivated as far back as Medieval times for both flavoring and medicinal use. 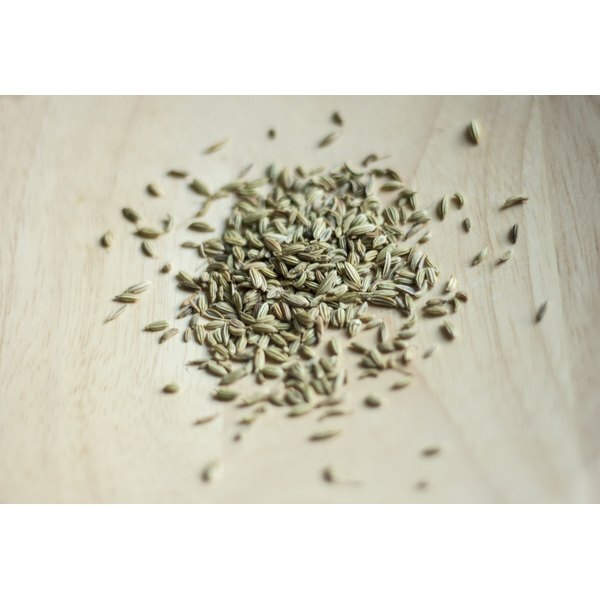 Today, fennel seed is being studied as having a role in the reduction of high blood pressure. Hypertension is the medical term for high blood pressure. Pressure that builds up inside the arteries can stretch and weaken the vessels, causing blood to flow less efficiently and leading the heart to pump harder to compensate. Hypertension can also increase the risk of blood clots, plaque buildup, and tissue and organ damage. High blood pressure is diagnosed when systolic pressure--the top number of a blood pressure reading--is greater than 140 and diastolic pressure--the bottom number--is greater than 90. Fennel is a very good source of potassium, containing 98 mg in 1 tbsp. Potassium, a dietary mineral, is important in the control of blood pressure because it counteracts the effects of sodium and regulates the amount of fluid present in the bloodstream. The DASH diet, which stands for dietary approaches to stop hypertension, recommends consuming foods rich in potassium, calcium and magnesium to lower blood pressure levels. As mentioned, calcium is another component of the DASH diet that has been studied for its beneficial effect on blood pressure. One serving of fennel seeds contains 7 percent of the recommended dietary intake for calcium in adults. Calcium is an important mineral for the regulation of blood pressure, as it helps to keep smooth muscles in the blood vessels toned and less likely to injure. Calcium is also important for maintaining heart rate. Fennel seeds are also a source of dietary fiber, which has also been studied for its effect on both blood pressure and heart disease. Seeds are composed primarily of insoluble fiber, which has been associated in observational studies with a reduction in blood pressure. Dietary fiber may also reduce inflammation and blood sugar levels, and aid in weight loss, all of which may occur as co-morbid conditions in those with high blood pressure. Fennel seeds contain 2 g of fiber per 1 tbsp. serving. Fennel seeds are sold as spices and are particularly flavorful with meats, poultry and fish. Seeds that are bright green color are freshest and best quality; seeds that are dark green, grown or gray are likely old. Store the seeds away from sunlight in an airtight container and use within 6 months of purchase. Fennel is a uterine stimulant, so pregnant women are advised against consuming large quantities. Additionally, the oil from fennel may cause dermatitis in those with sensitive skin, so take care when handling the seeds. Denise Reynolds is a registered dietitian, licensed in both North and South Carolina. She holds a Bachelor of Science degree in human nutrition from Winthrop University. Reynolds writes primarily about health and nutrition topics such as diabetes, heart disease, food allergies, and weight loss, either through lifestyle changes or weight loss surgery.